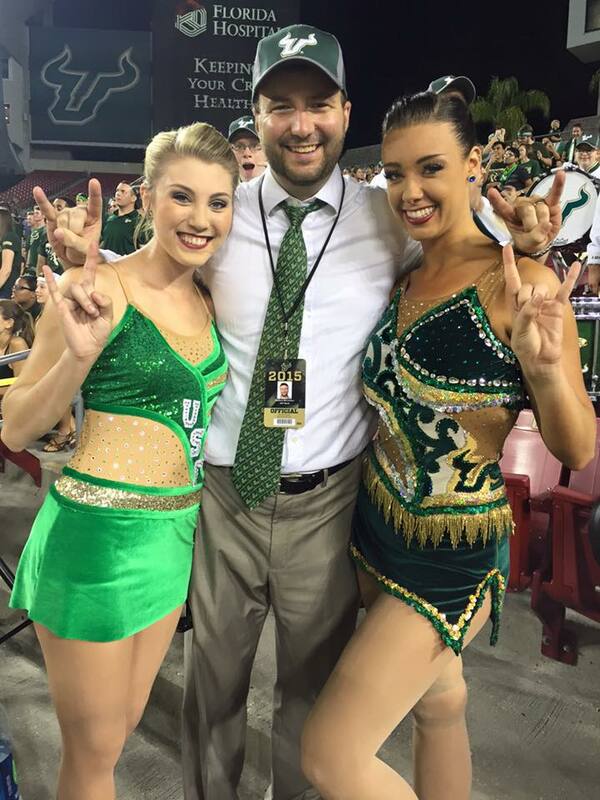 This past spring, after Morgan Boykin and Danielle Willis finished their first year together as feature twirlers for the USF Herd of Thunder, both were looking forward to a great upcoming season. Morgan had been twirling with the Herd for three years, and served as a friend and mentor to Danielle, who had just begun her journey as a college feature twirler. Just before the season began, though, Morgan was diagnosed with Postural Orthostatic Tachycardia Syndrome, or POTS, which is a form of dsyautonomia affecting the body’s automatic nervous system and involuntary functions. Suddenly, Morgan’s life as an active college student was turned upside down. In the span of several months, she went from twirling six hours a week to being confined to a wheelchair. 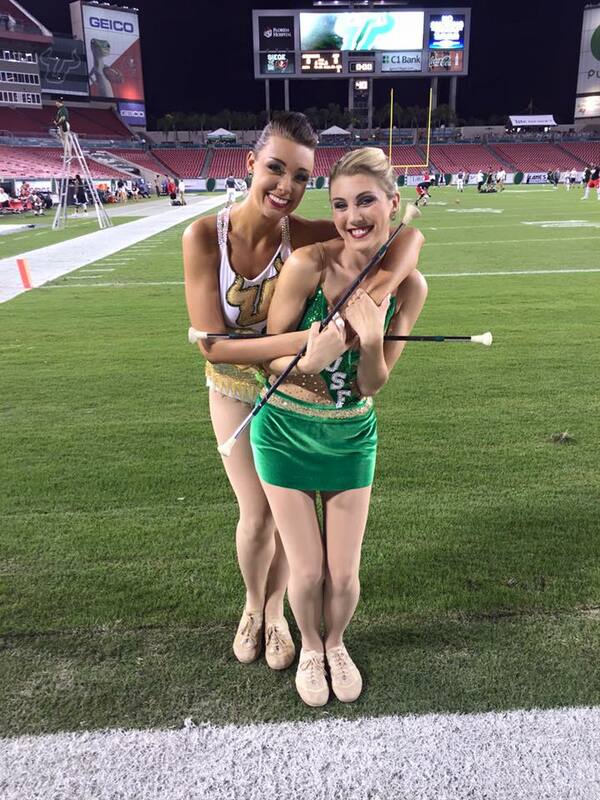 Meanwhile, Danielle faced the new challenge of filling USF’s feature twirler role alone and worried for her friend. Morgan and Danielle have been twirling since childhood, and each watched the other develop their respective skills in regional competitions where they’d meet. Over the years, the two became closer friends and eventually ended up as a dynamic twirling duo for the HOT marching band. 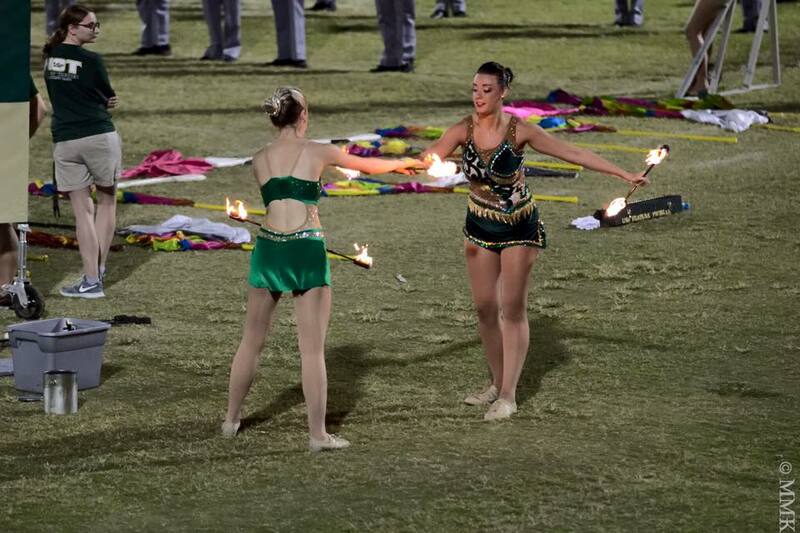 Danielle said that when she came on board, Morgan helped teach her everything she needed to be successful as a feature twirler, including how to twirl fire and prepare for band camp. For Morgan, her diagnosis meant she unfortunately must spend this season as a spectator rather than a performer while taking the fall semester off from school. 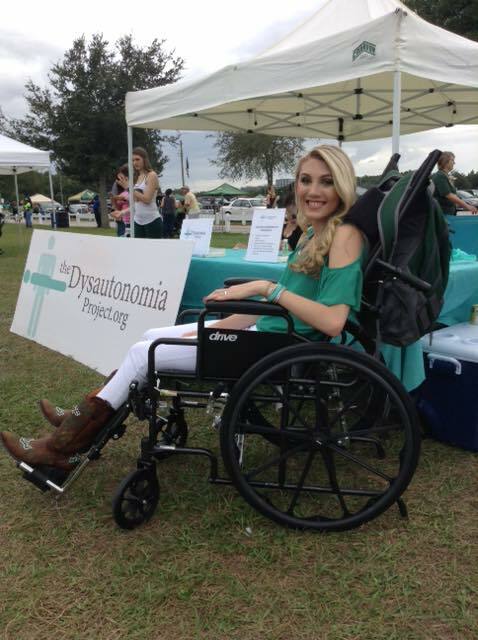 She is currently restricted to a wheelchair, since her severe case of POTS means her heart rate increases quickly with any physical activity. Though many in her shoes may have given up hope, Morgan’s message is one of courage and confidence. While there is no recognized cure for POTS, Morgan hopes that a combination of therapy and medication will help build her strength and endurance back up, letting her walk again and eventually resume normal activity. Both Morgan and Danielle said their HOT band family has been a critical source of strength as they’re each adjusting to new situations this season. At the start of the season, Danielle found it difficult to perform alone after being used to having Morgan by her side. From being upset about her friend’s health situation to adjusting her drill and routines, Danielle felt overwhelmed. Mid-season, Morgan received an email asking if the HOT band and athletic department could honor her at the USF vs. UConn game on October 15. Of all the memories she’s experienced with the HOT band and USF, Morgan said this was a special one she’ll never forget. As the season went on and it became clear Morgan would not be returning to the field this year, Danielle refocused her energy to become a solo twirler that would make her friend proud. HOT band Director Dr. Matthew McCutchen said spectators would never know Danielle started the season with concerns about twirling solo. McCutchen said it has been heartwarming to watch many new marchers whom never met Morgan reach out to her with messages of love and encouragement. At one point about two months into the season, Morgan showed up unannounced at the end of a rehearsal with her mother. Morgan recalls this same experience just as fondly. McCutchen credits the HOT band’s unwavering support to the character of each participant, and said most college marching students throughout the country would do the same if given the opportunity. To others who may be dealing with POTS or a similar diagnosis, Morgan prompts them not to give up. Though watching everyone else’s reality continue unchanged while you’re “stuck” may be difficult, she says, you have to stay strong.